A fleet of cubesats intent on advancing technology development, scientific research, and educational outreach recently hitched a ride into low Earth orbit (LEO). Through the Government Rideshare Advanced Concepts Experiment (GRACE), the National Reconnaissance Office’s (NRO) L-55 mission included an auxiliary payload of 13 small research satellites, four of which were sponsored by NASA and nine by the NRO. The four NASA cubesats were selected through the agency’s CubeSat Launch Initiative (CSLI) and were part of the Educational Launch of Nanosatellites (ELaNa) program. 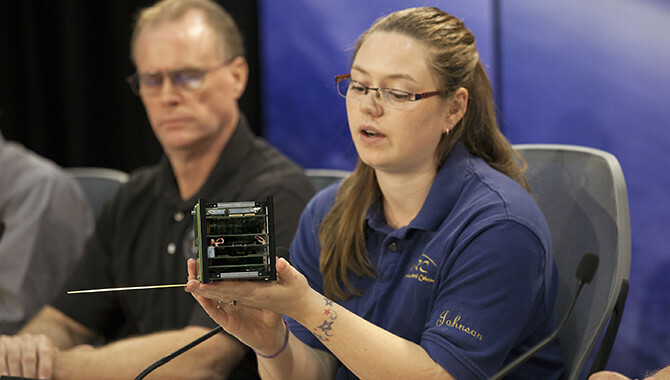 The two university-developed cubesats are the Alaska Research CubeSat (ARC 1), from the University of Alaska Fairbanks, and the BisonSat, from Salish Kootenai College in Pablo, Montana. Both satellites were designed and developed by students and faculty at the schools. ARC 1 is a technology demonstration mission with four objectives: measure the thermal environment in the launch vehicle to inform future missions, test a novel low-power attitude and determination system, test the rate of data transfer, and advance the functionality of the ARC subsystems. It is the first satellite designed, constructed, and operated by students in Alaska. “It’s really exciting to be able to work on a cubesat and to know that this hardware I built is going to be going into space and be able to give us data, take pictures of Alaska, get the launch requirement data, see our attitude system work. Everything working will just be a great achievement for everybody,” said team lead and University of Alaska Fairbanks graduate student Morgan Johnson. BisonSat will conduct a number of science studies and will contribute to the dataset of space-based imagery used by several tribal governments to make land-management decisions. It is the first satellite designed, developed, and operated by tribal college students. “Our interest in participating in the ELaNa XII program has primarily been to interest our students in considering a career in the aerospace industry in the U.S., either as an engineer or as a scientist, and to help address that national need of resupplying our workforce with talented people to keep the U.S. as a leader in this area,” said Tim Olsen, BisonSat principal investigator and Chairman of the Division of Sciences at Salish Kootenai College. JPL contributed the Low Mass Radio Science Transponder-Satellite (LMRST-Sat), a cubesat mission focused on raising the technology readiness level (TRL) of a radio science instrument. “The idea of radio science is that while you might think of radios being used to transfer information, such as an over-the-air television broadcast or from your cell phone, radio scientists actually measure the properties of the radio signals themselves. The extra delay as it goes through an atmosphere, or the change in frequency as a spacecraft flies by a planet due to its gravity,” said Courtney Duncan, principal investigator for LMRST-Sat. Fox-1, a cubesat designed and developed by the Radio Amateur Satellite Corporation (AMSAT), features a two-way FM communications transponder that can be accessed by the general public. “Fox-1 is our first cubesat, and the design of it was to include amateur radio and flight experiments for educational institutions,” said Jerry Buxton, principal investigator for the AMSAT satellite. The organization intends to foster educational opportunities by offering free software so individuals and classes around the country can engage with the findings from the experiments aboard Fox-1. “We also provide assistance with curriculum and classroom planning so that students can become involved with learning about the satellites, actually receiving it live, and working with the science that is brought down,” said Buxton. “As a non-profit corporation, we’re extremely happy that the NRO and NASA through the ELaNa program have given us the opportunity for this flight. It’s a substantial contribution to gaining access to the science and education in space,” he added. ELaNa missions are managed by the Launch Services Program (LSP) at Kennedy Space Center (KSC) and provide rideshare opportunities for cubesats identified through CSLI. In addition to the four ELaNa XII satellites, NASA funded a fifth cubesat on NRO-L55: the Optical Communications and Sensor Demonstration (OCSD) mission. Designed to explore laser communications, OCSD intends to significantly increase the rate and quantity of data transfer from LEO to ground. That mission is funded by the agency’s Small Spacecraft Technology Program (SSTP) and developed by the Aerospace Corporation in El Segundo, CA. The nine NRO-sponsored cubesats were developed by Aerospace, the Army Space and Missile Center, Tyvak Nano-Satellite Systems, and SRI International. The agency is pursuing other cubesat initiatives as well. The Space Technology Mission Directorate (STMD) Centennial Challenge Program sponsors the Cube Quest Challenge, which gives non-NASA individuals and teams the opportunity to compete in conceiving and developing cubesat technologies that will facilitate space exploration for NASA and the nation. The agency is also investing in commercial launch capabilities to support small satellites. The LSP recently awarded Venture Class Launch Services (VCLS) contracts for launch demonstrations to Firefly Space Systems Inc. of Cedar Park, TX, Rocket Lab USA Inc. of Los Angeles, CA, and Virgin Galactic LLC of Long Beach, CA. Watch a video showing the launch of the NROL-55 mission and 13 cubesats, including ACR 1, BisonSat, Fox 1, and LMRST-Sat.